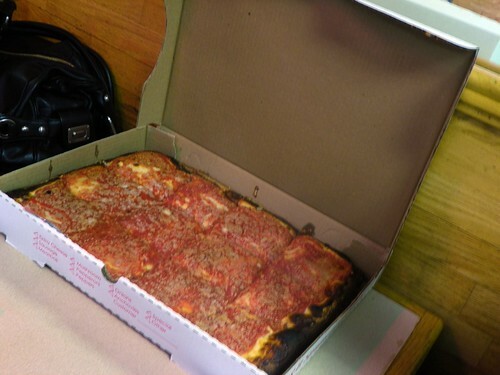 "When the moon hits you eye like a big (Sicilian) pizza pie…that’s amore!" On Saturday, Dave and I trekked, not unlike many adventurers before us, to lands unknown, in order to find the crème de la crème of ethnic foods. Bridges crossed, GPS cursed at (for sending us to the wrong location!) and over an hour in the car later, we finally made it to our destination. 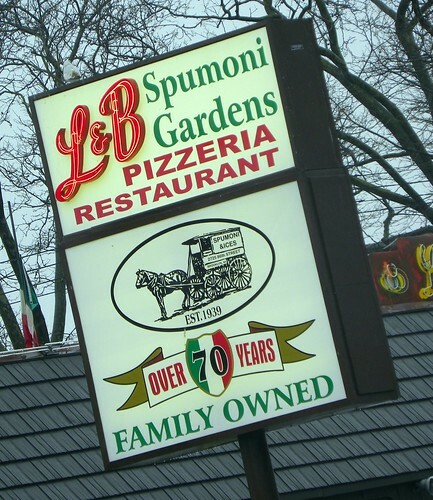 L&B Spumoni Gardens is an institution in Brooklyn. It’s over 70 years old, and has been owned by the original family since their humble beginnings with a pushcart and horse! (And Spumoni Gardens was featured on Man vs Food! I heart Adam Richman.) 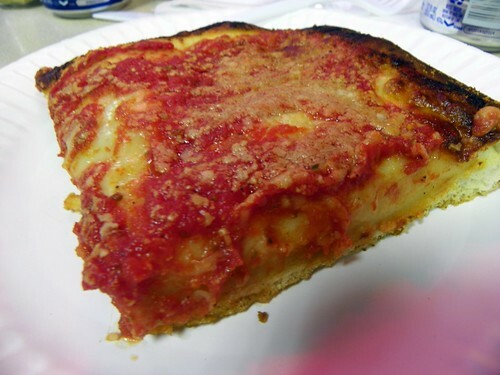 Located in Bensonhurst, people FLOCK from all over to grab a slice of their famous Sicilian pizza. (Don’t dare order a regular slice! Sicilian is the way to go.) There is usually a wait for tables and pizza, and since we were late to meet everyone, I was freaking out that the line would be insane. Lucky for us, the place wasn’t too crowded, and my BFF Allison did us a solid by grabbing some tables AND ordering a pie ahead of time, so it would be ready when we arrived. I chose my first slice with care, and went directly for a corner piece. (Dave swears by the middle slices, I’m a corner girl. I think we’re the same with brownies too.) From first glance, it looks like a normal, average Sicilian. 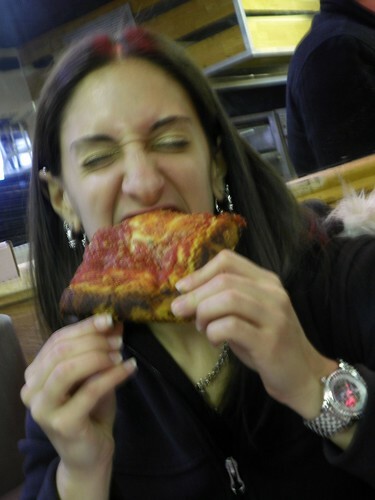 But then, upon first bite… my view on Sicilian pizza changed. I will state that I was never a fan of Sicilian pizza. I was (and still am) a thin crust loyalist. But this pizza… it was good. 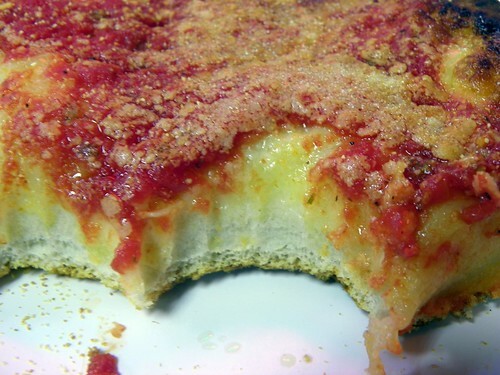 Most Sicilian slices, at least that I’ve had, are very dense, and thick, and almost too much dough. But this was a perfect ratio of crust, dough, cheese and sauce. Not too saucy, just enough cheese, the spices were spot on. How good was it?? I had 3 slices. THREE. If you know me, I barely finish anything. Except bags of microwave popcorn. Even though it was dripping gross cold rain outside, and we were stuffed to the gills with pizza, we ducked into the restaurant side of Spumoni Gardens next door for…. spumoni!!! If you aren’t aware of what spumoni is, Wikipedia defines it as “Italian ice cream made with layers of different colors and flavors, usually containing candied fruits and nuts. The ice cream layers are often mixed with whipped cream. Chocolate and pistachio are the typical flavors of the ice cream layers.” Yes please!!! I got pistachio, while Dave got chocolate. I’ve never had spumoni before, and it was kind of a blend between ices and ice cream, but very sweet!! Not going to lie, the pistachio was only OK. Wah wahhh. Dave’s chocolate was really good though. And I wish they would have had the cherry flavor, but no luck. Maybe next time!! In the works are plans to go to Di Fara’s, another Brooklyn pizza legend. We’ve gotta see how the two compare!! Is it like deep dish or not really? um. YUM. looks absolutely delicious. my carrots don't really compare right now, haha. delicious! it made me hungry and it's almost midnight here. crap. I live in Staten Island and at least once a month during the spring/summer I am at L&B. Absolutely amazing!! 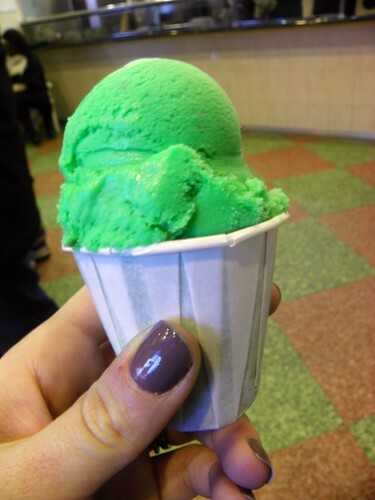 Try the original spumoni flavor, MUCH better. Waw!its looks yummy.thanks for the post. HELL YES!!! Such a great time with great friends!!! I am ready for some more! Allison knows pizza. Great shot. Amazing destination! I really should not have read this post before lunch. Now I'm starving! It seems that you and Dave were meant to be–you can have your corners and he can have his middles. You both win. Yum! Now I am fiending for pizza. Oh wow – looks delicious! That looks good. As a Chicagoan, I will say that NY has the best pizza I have tasted. The other day I had a parmesan and spinach pizza with a flatbread crust. So tasy. I love going to authentic places like that. That pizza looks amazing! YUM. If I every makek it to NYC, can we got there!? 😉 My Italian heart just totally fluttered…! Just found your blog via my giveaway on Justatitch… WHAT THE FABULOUS. I might love you, already. oh my gosh. I love all of those things.